I’m guessing when you saw the title of this post you probably expected to read something about the New York Giants and New England Patriots and their Super Bowl rematch. Don’t worry; we have two weeks to talk about that story. Instead, I want to share a déjà vu moment brought to you by Kyle Williams. I’m not one to kick a man when he’s down, but Williams’ fumble against the Giants yesterday was the turning point in that game. You can’t argue that thatplay was the most pivotal moment in that game. Yes, the Giants played their hearts out and Eli Manning continued to prove he is worthy of “Elite Quarterback” status. Yes, Lawrence Tynes did score the points that ultimately won the game. But without Williams’ fumble, the ending of the NFC Championship would’ve been different. I feel terrible for the kid. Imagine being 23-years old playing in the NFC Championship—something you and I could only ever dream of doing—and the ball is punted to you with the chance to put your team in decent field position. As you watch the ball fall in the pouring rain, you think, all you need to do is hold on to it. After the ball is caught, you advance 5 yards then all of a sudden you feel emptiness. Then, you feel the weight on your shoulders. The opposing team recovers on your own 24 yard line and the potential loss of the game suddenly fell on you. 4 plays later, your opponent snaps the ball, sets it, and kicks a 31 yard field goal to win the game 20-17. That has to be one of the worst feelings in the world, and I would never want to be in that situation. 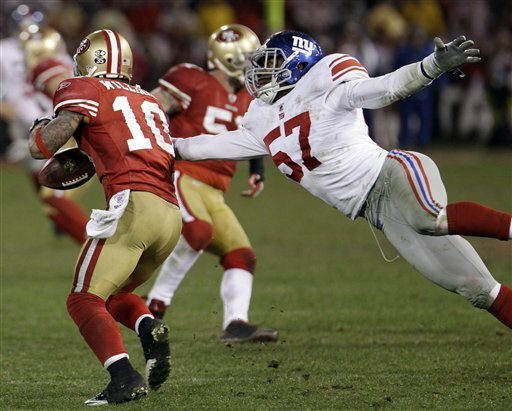 Unfortunately for Kyle Williams, this feeling isn’t completely new. 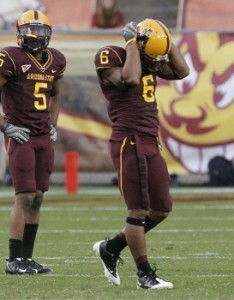 Let’s flash back to November 28, 2009, when Arizona State hosted Arizona in the final game of the season. Kyle Williams was having an outstanding day as a wide receiver for ASU, having caught 9 passes for 130 yards and 2 touchdowns—including the score to tie the game at 17 with 2:02 left to play. Arizona was unsuccessful at moving the ball down the field, so with 1:10 left to play, they punted the ball to none other than Kyle Williams. Williams fumbled the ball at his team’s 22 yard line. 4 plays later, Alex Zendejas for Arizona kicked a 32 yard field goal to win the game 20-17.